Cheryl Thonney’s summer internship at the WSU Prosser Irrigated Agriculture Research and Extension (IAREC) would make most people shudder. Among other tasks for her adviser, extension coordinator specialist Holly Ferguson, Thonney counted thousands of fly maggots from calf bedding samples. But having worked around cattle her whole life, the WSU sophomore took the gruesome task in stride. Ferguson and Thonney worked on a project to study alternative calf bedding treatments for fly control. In typical dairy facilities, bedding in calf housing makes an ideal bacterial environment for house and stable flies when it mixes with urine, manure, spilled milk and grain, and water. As a result, dairies constantly battle population outbreaks of these flies, which can transfer disease organisms and cause reduced milk production, in addition to annoying dairy personnel. Ferguson set out to test an integrated pest management approach for fly control rather than using insecticides: treating bedding with such alternatives as sodium bisulfate (SBS), sugar, kaolin, and diatomaceous earth. These alternatives, particularly SBS, lower the bedding’s pH, making it more acidic and inhospitable to bacteria, which fly larvae, or maggots, need to feed on. 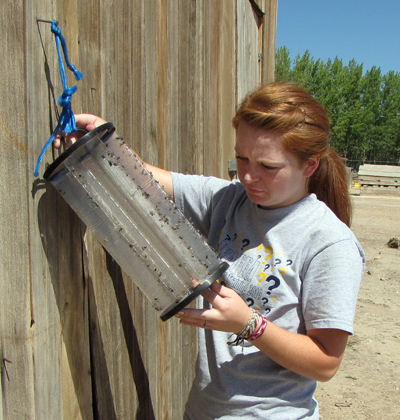 Thonney helped Ferguson over the summer by checking fly monitoring cards and sticky traps around calf hutches at several Yakima Valley commercial dairies to see how many flies were present. In addition, she collected bedding samples and measured bedding temperatures and pH in Ferguson’s lab. Thonney also froze treated and untreated bedding to count the number of maggots. Sodium bisulfate-treated bedding appeared to have fewer growing maggots, about 200-300 per sample compared to more than 1,000 maggots in an untreated sample. Far from being disgusted with the job, Thonney embraced the knowledge it gave her. But Thonney had quite a bit of her own background in agriculture to contribute to her internship. She lives two miles from the IAREC on a farm north of Prosser, Thonney Ranches. She grew up helping her family raise beef cattle and showing champion market steers at the fair. It’s no surprise that Thonney decided to major in agricultural education. She said she has wanted to be a teacher since the third grade, thanks to the example set by her father, Steve, a teacher at Housel Middle School in Prosser. She was also very active in FFA. Attending WSU is also a continuation of a family tradition for Thonney. Her father, raised in Pullman, received a bachelor’s degree in agricultural education in 1975 and a master’s in animal science in 1978. Thonney’s mother, Kathleen, graduated from WSU with a bachelor’s degree in business administration in 1977. Siblings Andrea and Robert also attended WSU; Andrea earned a bachelor’s degree in nursing in 2008, and Robert is a third-year vet student in Pullman. “We’re brainwashed,” Thonney said with a laugh. For her part, Ferguson said it was a pleasure to work with Thonney over the summer. The WSU student went above and beyond what was asked of her, even initiating new tasks when she’d completed what was assigned.